Before we begin – Yes, there are Game of Thrones spoilers ahead. I will not celebrate every twist and turn, but if we are going to talk about what we like, we have to discuss the great scenes. Stop reading if you do not like spoilers. You have been warned! With the ninth episode of a given season of Game of Thrones, you know business will get real. With an episode titled “The Battle of the Bastards,” you know that business will get real. And tonight’s episode delivered on that realness, bringing us the best episode of the season and an episode that probably goes down as a top five all-timer. The battle for Winterfell took over most of the episode, and paid off in an expertly-shot, brutally satisfying fight that meant a lot to the overall continuation of the story. It was so well done that it overshadowed the other development of the episode: Daenerys retaking Meereen and making steps towards her invasion of Westeros. The opening battle of Dany and the dragons against the invading masters was excellent. Her dragons are all gigantic, it is doubtful that anything in Westeros will be able to withstand them should they ever get there. Picture the titular battle for Winterfell, but with Daenerys joining in on a single dragon. How would either side cope with that? Her absolute massacre of the Master’s navy showed that she is a force to be reckoned with, as well as her gigantic khalisar riding in to defeat the Sons of the Harpy in the city. Finally, Grey Worm’s execution of two of the three Masters (and Tyrion telling the third to warn everyone else what will happen should they rise against the Dragon Queen) was a powerful exclamation point to show that Dany has won on this side of the world. 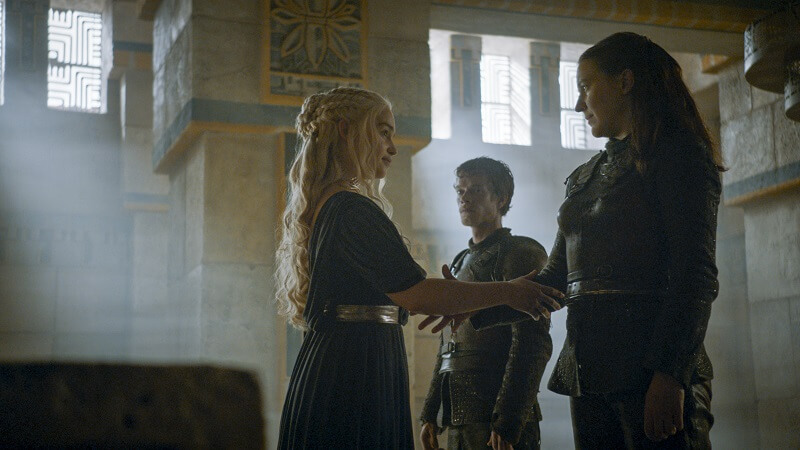 There is probably a new couple being shipped on Game of Thrones after this episode as well: who wants to see Daenerys and Yara together? There were an awful lot of smirks and eyebrow waggles thrown around during that conversation; even Tyrion noticed and gave it an eye roll. It will be interesting to see what happens now that Dany has joined up with the Iron Islanders, especially if their crazy uncle shows up to try to win Daenerys over (double that if Varys left in order to go and try to recruit the Greyjoys and returns to Meereen with Euron). I can already picture the fanfic about this one. And I like it. The showdown in Meereen was just a side dish. The main course was the Battle for Winterfell. The lead up was filled with tons of great moments: Lady Mormont watching Ramsay with utter disdain. Tormund not understanding anything about tactics or metaphors. Davos finding Shireen’s pyre. Jon and Sansa at each other’s throats, with Sansa practically echoing Ygritte’s famous “You know nothing” by screaming at him about Ramsay’s tactics. Sansa attacking Ramsay with the powerful line, “You’re going to die tomorrow, Lord Bolton. Sleep well.” And finally, Jon’s order to Melisandre: “If I fall, don’t bring me back.” All in all, the build up set the table for complete unknown. Maybe Game of Thrones would really let Ramsay take this one and continue his reign of terror. God, we sure hope not. 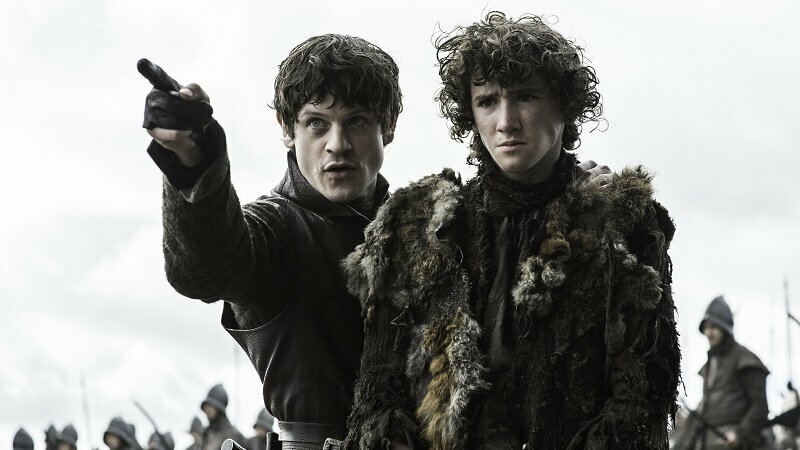 Immediately before the battle also brought about a fit of nervousness, as Ramsay’s “game” with Rickon ended exactly how everyone thought it would. Poor Rickon. He finally makes it back to the show and winds up as just another Ramsay casualty. If only he had learned to serpentine during his youth. The battle went predictably: Jon’s forces, although fearsome, weren’t enough to fight off Ramsay’s tactics and numbers. They were whipped into a panic, and Ramsay gleefully sacrificed his own men as part of his strategy. “Loose,” he repeated to his archers, as the bodies stacked up and formed a barricade. Jon’s troops got boxed in completely, just as Jon said would not happen during this fight. He had other things to worry about. A word needs to be said about this episode’s cinematography. This was a perfectly shot medieval battle. It captured the chaos, filth, and panic in an extremely believable way. The camera never got lost. No character felt “in a bubble,” as even when we were focused on a single person it felt like part of the bigger picture. Jon obviously had luck on his side (or perhaps a touch of the divine), but it really felt like we might lose him again. And then the knights of the Vale arrived. Sansa looked smug as all hell about it. Tormund tore out the throat of the traitorous Smalljon Umber with his teeth. Just like that, the battle turned. Back at Winterfell, we finally got the showdown we needed: the one-on-one “Battle of the Bastards.” Jon gave Ramsay what he deserved, beating him nearly to death in front of everyone. However, Ramsay’s death was even better than that: fed to his own hounds as Sansa watched. The smirk on her face as she walked away was a bit troublesome; Sansa is dancing dangerously close to the dark side. 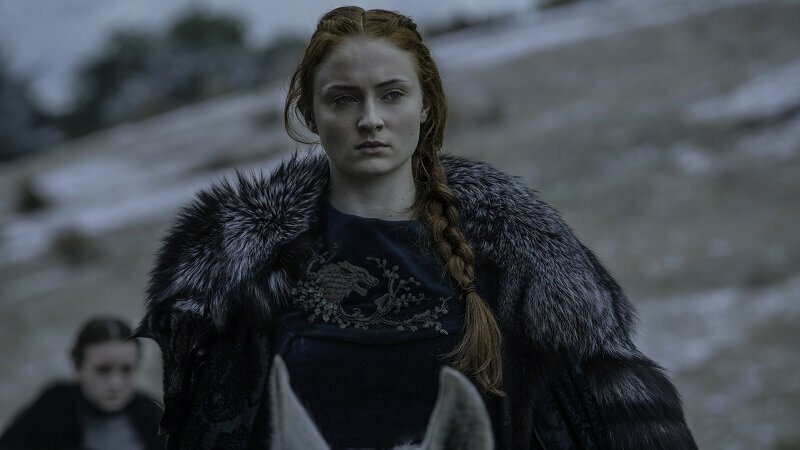 Hopefully she does not become as obsessed with revenge as that other Stark girl… However, it was a fitting end for the most hated character on Game of Thrones. So who will step up and fill the void? She’s stonehearted, but not that stonehearted. 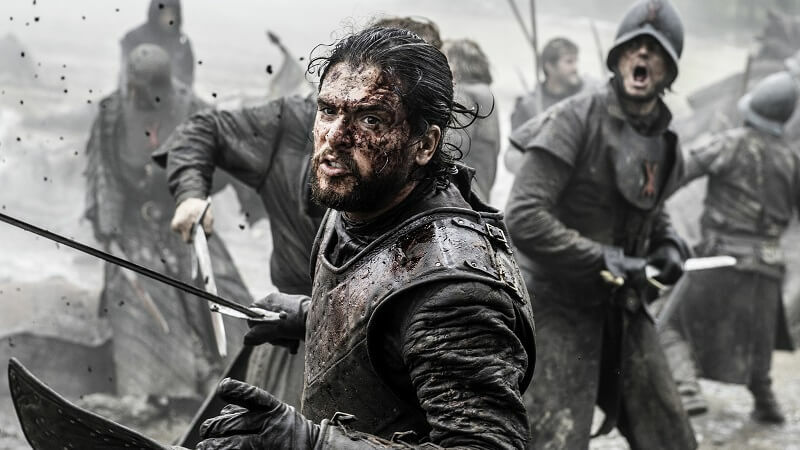 Overall, “The Battle of the Bastards” was another great penultimate Game of Thrones episode. 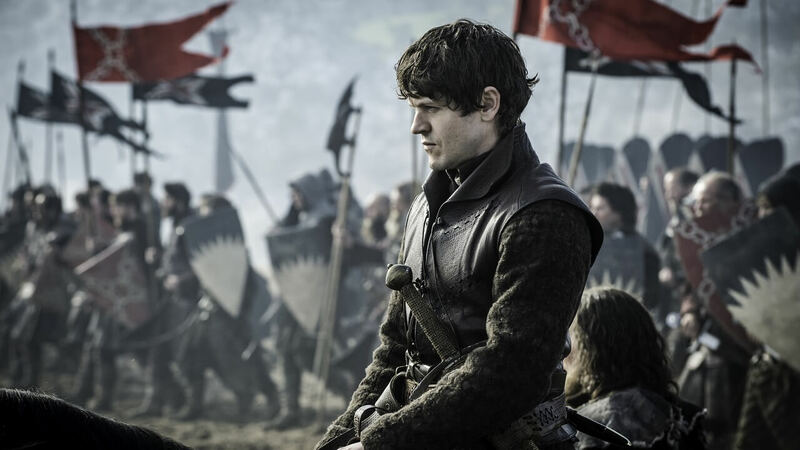 The body count of characters who matter was surprisingly low, but Ramsay Bolton being torn apart by his own hounds was a great send off for the detestable character. Tons of questions still remain for the finale. What is Daenerys’s plan now? What will Jon do? What does Sansa owe creepy Uncle Petyr? Finale aside, remember “The Battle of the Bastards.” It was one of the best episodes of Game of Thrones ever. It was beautifully shot, full of tension, and had a great ending to a hated villain. Characters: A very focused episode highlighted every character it focused on. Daenerys was ruthless. Ramsay was despicable. Jon was heroic. Sansa was powerful. Story: A satisfying end to the Bolton lineage. Jon and Sansa took back their home. But what price will they have to pay? Cinematography: Best of the season. The shooting was tight and focused. It perfectly captured the chaotic feel of the battle without losing the viewer. Acting: Ramsay stole the show with his smirks and confidence. Everyone else played their part well, but the best stories often have the best villains. Ramsay was great while he lasted. Jon and Ramsay battle for the fate of the North. The battle was beautifully shot.